To simplify the calculation explanation, RSI has been broken down into its basic components: RS, Average Gain and Average Loss. This RSI calculation is based on 14 periods, which is the default suggested by Wilder in his book. Losses are expressed as positive values, not negative values. Taking the prior value plus the current value is a smoothing technique similar to that used in calculating an exponential moving average. This also means that RSI values become more accurate as the calculation period extends. SharpCharts uses at least 250 data points prior to the starting date of any chart (assuming that much data exists) when calculating its RSI values. To exactly replicate our RSI numbers, a formula will need at least 250 data points. Wilder's formula normalizes RS and turns it into an oscillator that fluctuates between zero and 100. In fact, a plot of RS looks exactly the same as a plot of RSI. The normalization step makes it easier to identify extremes because RSI is range-bound. When the Average Gain equals zero, RSI is zero. Assuming a 14-period RSI, a zero RSI value means prices moved lower all 14 periods and there were no gains to measure. RSI is 100 when the Average Loss equals zero. This means prices moved higher all 14 periods and there were no losses to measure. Here's an Excel Spreadsheet that shows the start of an RSI calculation in action. Note: The smoothing process affects RSI values. RS values are smoothed after the first calculation. Average Loss equals the sum of the losses divided by 14 for the first calculation. Subsequent calculations multiply the prior value by 13, add the most recent value and then divide the total by 14. This creates a smoothing affect. The same applies to Average Gain. Because of this smoothing, RSI values may differ based on the total calculation period. 250 periods will allow for more smoothing than 30 periods and this will slightly affect RSI values. 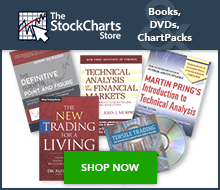 StockCharts.com goes back 250 days whenever possible. If Average Loss equals zero, a “divide by zero” situation occurs for RS and RSI is set to 100 by definition. Similarly, RSI equals 0 when Average Gain equals zero. The default look-back period for RSI is 14, but this can be lowered to increase sensitivity or raised to decrease sensitivity. 10-day RSI is more likely to reach overbought or oversold levels than 20-day RSI. The look-back parameters also depend on a security's volatility. 14-day RSI for internet retailer Amazon (AMZN) is more likely to become overbought or oversold than 14-day RSI for Duke Energy (DUK), a utility. Wilder considered RSI overbought above 70 and oversold below 30. Chart 3 shows McDonalds with 14-day RSI. This chart features daily bars in gray with a 1-day SMA in pink to highlight closing prices (as RSI is based on closing prices). Working from left to right, the stock became oversold in late July and found support around 44 (1). Notice that the bottom evolved after the oversold reading. Bottoming can be a process - this stock did not bottom as soon as the oversold reading appeared. From oversold levels, RSI moved above 70 in mid September to become overbought. Despite this overbought reading, the stock did not decline; instead, it stalled for a couple weeks and then continued higher. Three more overbought readings occurred before the stock finally peaked in December (2). Momentum oscillators can become overbought (oversold) and remain so in a strong up (down) trend. The first three overbought readings foreshadowed consolidations. The fourth coincided with a significant peak. RSI then moved from overbought to oversold in January. The stock ultimately bottomed around 46 a few weeks later (3); the final bottom did not coincide with the initial oversold reading. Like many momentum oscillators, overbought and oversold readings for RSI work best when prices move sideways within a range. Chart 4 shows MEMC Electronics (WFR) trading between 13.5 and 21 from April to September 2009. The stock peaked soon after RSI reached 70 and bottomed soon after the stock reached 30. According to Wilder, divergences signal a potential reversal point because directional momentum does not confirm price. A bullish divergence occurs when the underlying security makes a lower low and RSI forms a higher low. RSI does not confirm the lower low and this shows strengthening momentum. A bearish divergence forms when the security records a higher high and RSI forms a lower high. RSI does not confirm the new high and this shows weakening momentum. Chart 5 shows Ebay (EBAY) with a bearish divergence in August-October. The stock moved to new highs in September-October, but RSI formed lower highs for the bearish divergence. The subsequent breakdown in mid-October confirmed weakening momentum. A bullish divergence formed in January-March. The bullish divergence formed with eBay moving to new lows in March and RSI holding above its prior low. RSI reflected less downside momentum during the February-March decline. The mid-March breakout confirmed improving momentum. Divergences tend to be more robust when they form after an overbought or oversold reading. Before getting too excited about divergences as great trading signals, it must be noted that divergences are misleading in a strong trend. A strong uptrend can show numerous bearish divergences before a top actually materializes. Conversely, bullish divergences can appear in a strong downtrend - and yet the downtrend continues. Chart 6 shows the S&P 500 ETF (SPY) with three bearish divergences and a continuing uptrend. These bearish divergences may have warned of a short-term pullback, but there was clearly no major trend reversal. Wilder also considered failure swings as strong indications of an impending reversal. Failure swings are independent of price action, focusing solely on RSI for signals and ignoring the concept of divergences. A bullish failure swing forms when RSI moves below 30 (oversold), bounces above 30, pulls back, holds above 30 and then breaks its prior high. It is basically a move to oversold levels and then a higher low above oversold levels. Chart 7 shows Research in Motion (RIMM) with 10-day RSI forming a bullish failure swing. A bearish failure swing forms when RSI moves above 70, pulls back, bounces, fails to exceed 70 and then breaks its prior low. It is basically a move to overbought levels, followed by a lower high beneath those levels. Chart 8 shows Texas Instruments (TXN) with a bearish failure swing in May-June 2008. In Technical Analysis for the Trading Professional, Constance Brown suggests that oscillators do not travel between 0 and 100. This also happens to be the name of the first chapter. Brown identifies a bull market range and a bear market for RSI. RSI tends to fluctuate between 40 and 90 in a bull market (uptrend) with the 40-50 zones acting as support. These ranges may vary depending on RSI parameters, strength of trend and volatility of the underlying security. Chart 9 shows 14-week RSI for SPY during the bull market from 2003 until 2007. RSI surged above 70 in late 2003 and then moved into its bull market range (40-90). There was one overshoot below 40 in July 2004, but RSI held the 40-50 zone at least five times from January 2005 until October 2007 (green arrows). In fact, notice that pullbacks to this zone provided low risk entry points to participate in the uptrend. On the flip side, RSI tends to fluctuate between 10 and 60 in a bear market (downtrend) with the 50-60 zone acting as resistance. Chart 10 shows 14-day RSI for the US Dollar Index ($USD) during its 2009 downtrend. RSI moved to 30 in March to signal the start of a bear range. The 40-50 zone subsequently marked resistance until a breakout in December. Andrew Cardwell developed positive and negative reversals for RSI, which are the opposite of bearish and bullish divergences. Cardwell's books are out of print, but he does offer seminars detailing these methods. Before discussing the reversal technique, it should be noted that Cardwell's interpretation of divergences differs from Wilder. Cardwell considered bearish divergences to be bull market phenomena - in other words, bearish divergences are more likely to form in uptrends. Similarly, bullish divergences are considered bear market phenomena indicative of a downtrend. A positive reversal forms when RSI forges a lower low and the security forms a higher low. This lower low is not at oversold levels, but usually somewhere between 30 and 50. Chart 11 shows MMM with a positive reversal forming in June 2009. MMM broke resistance a few weeks later and RSI moved above 70. Despite weaker momentum with a lower low in RSI, MMM held above its prior low and showed underlying strength. In essence, price action overruled momentum. A negative reversal is the opposite of a positive reversal. RSI forms a higher high, but the security forms a lower high. Again, the higher high is usually just below overbought levels in the 50-70 area. Chart 12 shows Starbucks (SBUX) forming a lower high as RSI forms a higher high. Even though RSI forged a new high and momentum was strong, the price action failed to confirm as lower high formed. This negative reversal foreshadowed the big support break in late June and sharp decline. RSI is available as an indicator for SharpCharts. Once selected, users can place the indicator above, below or behind the underlying price plot. Placing RSI directly on top of the price plot accentuates the movements relative to price action of the underlying security. Users can apply “advanced options” to smooth the indicator with a moving average or add a horizontal line to mark overbought or oversold levels. This scan reveals stocks that are in an uptrend with oversold RSI. First, stocks must be above their 200-day moving average to be in an overall uptrend. Second, RSI must cross below 30 to become oversold. This scan reveals stocks that are in a downtrend with overbought RSI turning down. First, stocks must be below their 200-day moving average to be in an overall downtrend. Second, RSI must cross above 70 to become overbought. For more details on the syntax to use for RSI scans, please see our Scanning Indicator Reference in the Support Center. Constance Brown's Technical Analysis for the Trading Professional takes RSI to a new level with bull market and bear market ranges, positive and negative reversals, and projections based on RSI. Some methods of Andrew Cardwell, her RSI mentor, are also explained and refined in the book.